We must examine Russia’s aggressive actions this week through the lens of history. In 2016 I sat in a clean but aging hotel in the Turkish border town of Gazi Antep with a young man who acted much older than his face appeared. He held his Android phone in his hand like a rectangular witness as he played the video he wanted me to see. The images bounced around and the narrator sounded out of breath and panicked. “This is the hole in the ground where my house used to be,” he told me. He shot the video as he ran from a friend’s house to his family’s house in the immediate aftermath of a Russian air strike in his hometown of Aleppo, Syria. He told me how close the strike had sounded and how he had run back to his family. Fearing the worst, he arrived to find that the worst had indeed happened. The truth is that President Vladimir Putin has known for years that Russian aggression would be met with a lot of discussion and a great deal of public handwringing. I worked to explain how the ghost of the Iraq war hung over every U.S. policy decision made about Syria, how America did not want to enter another war in the Middle East. But the question hung there, and he wasn’t the only one asking. The truth is that President Vladimir Putin has known for years that Russian aggression would be met with a lot of discussion and a great deal of public handwringing. These stern warnings and sanctions would not actually hamper his movements, however. 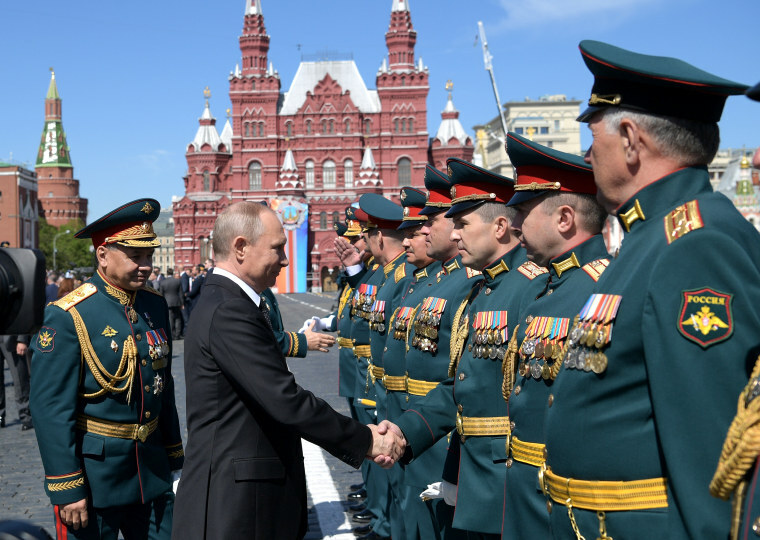 Examining Russia’s newly aggressive actions this week through the lens of history provides one explanation as to exactly why the Kremlin now believes it can put the international community on mute and go about its business unmolested. We can start with the 2014 annexation of Crimea. President Barack Obama’s administration reacted to the Russian invasion with impassioned words and a stream of economic sanctions but no counter that counted — at least in Russia’s eyes — which did much to bolster Putin’s confidence. Then came the Russian air campaign in Syria. The season of airstrikes began in late 2015 and immediately was met with great international condemnation. But that condemnation was neither novel nor fact-shaping for the Russian regime. Indeed, the lesson learned, again, was that more is more in a world where no one — not even the mighty, moral United States — is willing to stop your desire to shape facts on the ground. Or curb your willingness to create holes in the ground. “Beyond the pale” is how then-Secretary of State John Kerry described the bombing of Aleppo. Putin responded with months of airstrikes which shored up Syrian President Bashar al-Assad’s regime, killed civilians and created, as an added and perhaps unexpected bonus for Moscow, a monstrous global refugee crisis. Many of those Syrian refugees ended up in Turkey and eventually attempted to find safety on Europe’s shores, creating a series of diplomatic ripple effects that would end up dooming German Chancellor Angela Merkel, a Putin opponent. Merkel’s attempt to shelter those fleeing the terror of Russian airpower opened up a door for her political foes and doubtless was an important factor in her decision this year to step down from the chancellorship. Now comes the latest crisis in Ukraine, after Russian ships opened fire while two Ukrainian gunboats and a tugboat traveled through the Kerch Strait off the coast of Crimea. Ukrainian President Petro Poroshenko told NBC News that his country is under "extremely serious" threat of a land invasion and declared martial law for 30 days in regions adjacent to Russia. Russia, for its part, announced Wednesday that it would deploy another powerful S-400 surface-to-air missile systems to Crimea. If past is prologue then the present was predictable. And calm and restraint look a long way off.